| SHARAN'S SAMAYALARAI |: Happy Pongal !!
" Wishing all my friends and readers a very happy Pongal!! Let this festival brings good luck, wealth, prosperity and happiness. Have a wonderful Pongal, Hope you rejoice in the charm of your tradition! " Pongal is said to be main festival for Hindus in Tamilnadu. It is prominently celebrated in southern states Andhra Pradesh, Karnataka and Tamilnadu. 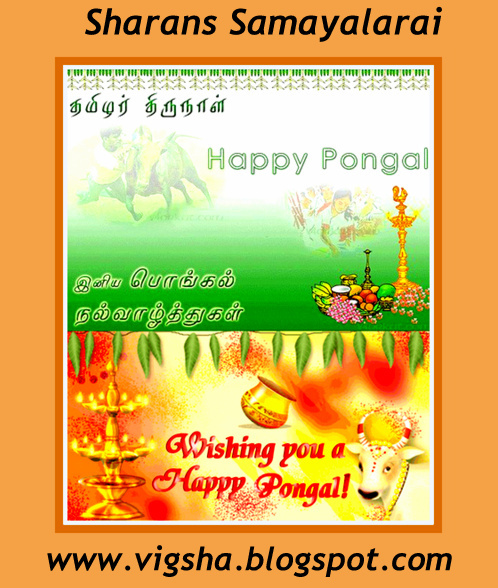 Pongal is the harvest festival and farmers celebrate this festival with great enthusiasm. The new crop that is harvested is cooked and offered to the Almighty. Pongal is celebrated as four day festival. The first day of Pongal starts as Bhogi Pongal and this falls on 13th January 2013, it is celebrated by worshipping Indra the god for rain. People would lit fire in the early hours of the Bhogi day using old wooden furniture or items. All the people come together around the fire and enjoy the warmth of the fire in the cold weather during Bhogi. The houses are then cleaned till they shine and are decorated with Kolams painted using rice four. Big Rangolis are drawn in front of houses to welcome goddess Lakshmi. The second day is the main festival of Pongal also known as Surya Pongal is falling on 14th January 2013, its dedicated to the Sun God. The granaries are kept full on this day and Sun God with his rays are painted on a plank as he is worshiped with the birth of the new auspicious month of Thai. Since the word 'Ponga' means 'to boil' representing plentiful and excess yield, a special dish is cooked on this day in a new mud-pot that comes in innovative shapes and have artistic designs on them called 'Pongapani'. The special dish is called 'Sarkkarai Pongal' and is offered to Sun God with sugarcane sticks. It is said that Lord Sundareshwar performed a miracle on this day in the Madurai temple and breathed life into a stone elephant who ate sugarcanes. One can see the depiction of the event in the Meenakshi temple. 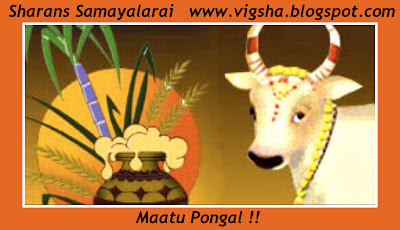 -------------------- The third days is called as Maatu Pongal, falls on 15th of January 2013. This day is dedicated to the cattle as cowherds and shepherds pay thanks to their cows and bulls, paint their horns and cover them with shining metal caps. They are fed 'Pongal' and tinkling bells are tied around their neck. Cattle races are conducted and in the game called 'Manju Virattu' groups of young men chase running bulls. Bull fights called 'Jallikattu' are also arranged at some places where young men have to take the money bags tied to the horns of ferocious bulls single-handedly and without the use of arms. Lord Ganesha and Goddess Parvati are also worshiped on this day. The fourth day of the pongal is called Kaanum Pongal, falls on 16thof January 2013. On this day, people travel to see other family members. On this day, the younger members of the family pay homage to the elders, and the elders thank them by giving token money.